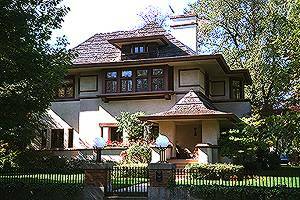 William Gray commissioned Wright in 1906 to remodel this house, which was originally on the open lot just north of its present location. The house was for Gray's daughter, Mary, who was married to Edwards Hills. Essentially nothing remains of the original house from 1874: The exterior walls were covered with stucco, subdivided by rough boards stained dark brown; The windows were organized into horizontal bands; The roofs were redone with soffits that projected beyond the walls, and with double slopes and high pitches recalling Wright's designs from the mid 1890's. This house was severely damaged by fire while being restored in 1976. Mr. and Mrs. Thomas DeCaro undersaw its extensive reconstruction in 1977, including the restoration of features lost over the years through remodeling. For this reason, this is often called the "Hills/DeCaro House".